Addiction is a powerful physiological process … not a weakness of character or lack of discipline. Doctors, lawyers, judges, pastors, star athletes, CEO's, and heads of state have all experienced the gripping reality of a personal opioid addiction. Opioid dependency is classified as a true medical condition and is the direct result of dramatic brain structure changes. Once these brain structure changes take hold, an individual is no longer left with an easy choice to "simply not use", but is faced with an overpowering & persistent compulsion to feed an opioid drug hunger. No one wants to become addicted. Remember, the person did not want this to happen. This overpowering urge is a phenomenon that most non-addicted people have difficulty understanding. People often naively ask "Why can't they just stop?" If it were that easy, they would! For an opioid dependent individual, the overpowering urge to use is very similar to a typical person experiencing extreme hunger after not eating for a prolonged period of time. The longer one goes without food, the more intense becomes their physical discomfort, and the hungry person becomes sharply focused on finding something to eat. This is a powerful physiological drive that blocks out other goals & considerations … until the need is met. Another illustration is a person severely dehydrated and overcome with the desire to take in fluids. When they get to water, they rapidly gulp it down trying to satisfy their extreme thirst. Yet another example is the powerful sleep mechanism which kicks in after many hours wide awake. If you have ever watched someone fight sleep, you will inevitably see them give in to sleep as the body's physiological need overcomes the individual's intention to remain awake. And such is the case with a physiological dependency on opioids. The drive to use becomes increasingly powerful and eventually overwhelms the addicted individual. Due to structural changes within the brain, the brain begins to crave opiates like people crave food, water, and sleep. And just as someone becomes intensely symptomatic when deprived of food, water, or sleep, the opioid dependent person becomes increasingly sick from opioid withdrawal, and desperate to end their physical discomfort. force an individual to seek relief. 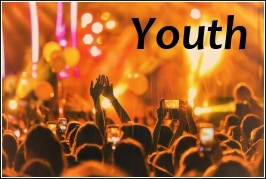 Addiction often begins with a legitimate opioid prescription for temporary pain relief, or brief experimental use for recreational purposes (such as taking a friend's pain pill). 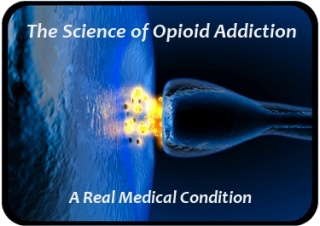 The individual discovers that the opiate/opioid successfully controls pain or provides a sense of euphoria or pleasure. As use of the opioid continues, cell adaptation occurs and tolerance to the opioid begins to grow. This requires larger amounts of the opioid in order to achieve the same effect. For some people, a physical dependency can come about quickly. For others, it may take longer. Once physically "hooked", a person will experience uncomfortable withdrawal symptoms as the effect of the opioid wears off. An intense drug craving develops. The person's discomfort is immediately relieved by taking more of the drug. They do this, and the addictive cycle evolves into a long term problem. The illustration below depicts the loss of life focus which occurs in opioid addiction progression. As a tolerance to opioids builds, users must take more of the drug to achieve the same effect. Preoccupation (or mental preoccupation) is a symptom of addiction progression in which thinking about opiate use and planning for opiate use begin to dominate conscious thought & waking time. Once full blown physical withdrawal emerges, mental preoccupation can become so overpowering that the individual's life becomes replaced by daily craving for opiates and the need to obtain them. 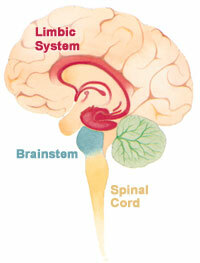 The Limbic System (includes the hippocampus, amygdala, hypothalamus, and other structures) – Controls human emotion, behavior, long term memory, sense of smell. Opiate effect is primarily one of producing pleasure, relaxation, and feelings of well-being. The Brainstem (includes the medulla oblongata, pons, and midbrain) – Regulates vital functions such as breathing and cardiovascular system control, alertness, and consciousness. Opiate effect here is to slow breathing, stop coughing, and lessen feelings of pain. The Spinal Cord (a thin, tubular column of nerves which extend downward from the medulla oblongata) – Serves as a conduit for motor and sensory messages and a center for coordinating reflexes. Opiate effect here is to decrease feelings of pain. There are three identified types of opiate receptors found in the body. They are the mu, delta, and kappa receptors primarily located in the brain, spinal cord, and digestive tract. Each of the receptor varieties serve specific functions with the mu receptors predominantly responsible for pleasure effects and pain relief (analgesia) when activated. 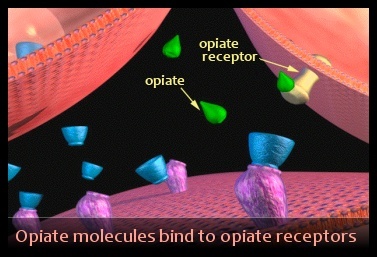 As opiates enter the bloodstream, they bind with opiate receptors in the brain (see diagram on the left) leading to euphoric effects and pain reduction. 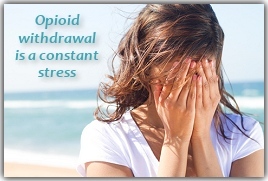 For the opiate dependent person, uncomfortable withdrawal symptoms begin to subside and the individual experiences both physical and emotional relief. Methadone, compared with other opioids, is a long lasting medication that remains present in the body much longer than heroin or other commonly prescribed pain pills. This means that methadone is available to bind with opiate receptors for a longer duration thus producing extended relief from painful withdrawal symptoms. This relief from withdrawal sickness allows the individual to resume normal daily activities and responsibilities. An added benefit of methadone is that it blocks the effects of other opiates and consequently discourages opiate misuse. Since methadone occupies the opiate receptor sites for an extended period of time, using other opiates becomes pointless because there are no available opiate receptors to be activated. This "blocking" effect is most effective once a client is on a stable methadone dose, and is a recovery-enhancing benefit of methadone maintenance treatment (MMT).